One of horary astrology’s claims is to be able to locate and find lost objects. Quite a few books have been written exclusively about this subject, and many other horary books have a chapter or so dedicated to this feat. Naturally to the skeptic, this is blatant rubbish and derisory. Thinking about it, it is hard to believe. So who can blame the person not well versed in horary as to their incredulous outcry when the horary astrologer asserts this is indeed possible. With this mind I would like to unwrap and lay out some of my thoughts and experience with the practice of locating lost objects using traditional methods of horary astrology. 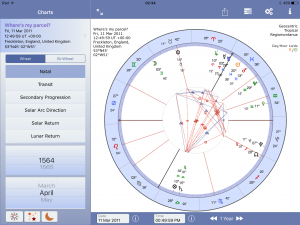 Before I start I would like to applaud the skyscript website for their analysis of lost object horary charts by their talented forum writers. Their willingness to put their horary methods to the test – which are open to public scrutiny as well as by their peers is extremely helpful to anyone studying the horary art. Of course one of the best sources of horary examples is the book Christian Astrology, by William Lilly, surely one of the best-known books on horary, and natal astrology. Originally published in 1647, the 1985 facsimile edition heralded a new dawn for horary in my opinion. My teacher, Olivia Barclay had this edition and showed it to me when I visited her many years ago. She was, among others, responsible for the awakening of a renewed interest in horary which is still being felt today. I came home early one day from work (I think) and found a message from the postman that stated the parcel I was expecting had been left in my garage which is situated close to my house. I use the garage as a storage place and assumed it was locked. I was confident that I’d locked the garage door. I didn’t know how the postman could have left the parcel in the garage. It was a puzzle. I began to think that I’d misread his card. I went to the garage and tried to open the door – it wouldn’t open, it was locked – just as I’d thought. I re-read the postman’s card and tried again to open the garage door, but to no avail. Time to cast a horary I thought. If you will know how in what manner they were lost, behold from whom the Lord of the Ascendant did last separate…. If from Mercury by reason of writing, or sending, or dictating of Letters, or going on a Message. In the horary the Moon’s last aspect is a sextile to Mercury – the postman that I just missed that morning? The Moon is also a natural significator for anything lost, but in this horary it’s my significator so that ruling doesn’t really apply here. What I’m looking for is a connection between the lost parcel and me – Moon and the Sun. The next aspect the Moon makes is to Jupiter. That’s promising. Also, Jupiter is the depositor of the Sun. I think we’re on to something here. Note that Mars and the Sun are in mutual reception with Jupiter. My lost parcel is signified by the 2nd house ruler, the Sun which is in the 9th house. Now this had me shaking my head. How could the parcel be abroad? But hang on a minute I thought. In the context of the question the garage was the furthest part of the property from the house – at least that’s how I saw it. Not exactly a foreign land (the 9th house rules foreign lands), but the symbolism spoke to me eloquently enough for me to realise that the postman had to be right. I immediately went back to the garage and this time the door opened – it took a bit of coaxing. There was the parcel, and another packet too. The Lord of the second in the 10th or 9th, it is in the house of the Querent,….. I began to see the symbolism of Mars in the same house as the Sun. The parcel I was expecting contained an expensive pair of shoes (signified by Sun in Pisces), by an Italian designer – maybe a reference to the 9th house, if I’m not stretching the analogy too far. The other parcel contained kitchen cleansing material, bought from a charity – signified it seems to me quite accurately by Mars in Pisces. Both Sun and Moon ‘under the earth‘. Both Sun and Moon are above the earth. Raphael, Raphael’s Horary Astrology, W. Foulsham, 1927, p69. Kessinger reprint. I could not resіst commenting. Well written!